(Nanowerk News) A single drop of blood is teeming with microorganisms--imagine if we could see them, and even nanometer-sized viruses, with the naked eye. That's a real possibility with what scientists call a "perfect lens." The lens hasn't been created yet but it is a theoretical perfected optical lens made out of metamaterials, which are engineered to change the way the materials interact with light. While a perfect lens--and the metamaterials it's made of--is almost perfect, it's not foolproof. As the field of research expanded in the past 15 years, more and more challenges arose. Now, researchers at Michigan Technological University have found a way to possibly solve one of the biggest challenges, getting light waves to pass through the lens without getting consumed. The journal Physical Review Letters published their study this July ("Plasmon Injection to Compensate and Control Losses in Negative Index Metamaterials") and is a continuation of work done by Durdu Güney, a professor of electrical and computer engineering at Michigan Tech. 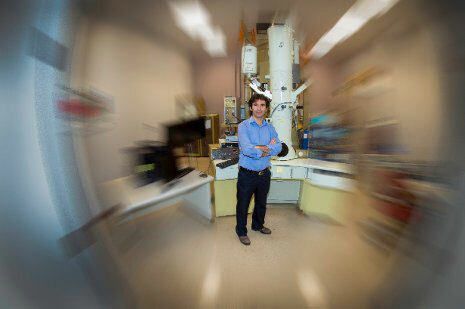 Durdu Guney stands in his lab where he and his team work on a metamaterial-based "perfect lens". Güney worked alongside Mehdi Sadatgol, a PhD candidate at Michigan Tech, and Sahin Kaya Özdemir and Lan Yang, both at the Department of Electrical and Systems Engineering of Washington University in St. Louis. As the team writes in their paper, "These findings open the possibility of reviving the early dreams of making 'magical' metamaterials from scratch." Metamaterials are often based on natural materials but can be altered to have completely different optical properties. Metamaterials go beyond the limits of natural materials such as glass, plastic, metal or wood. To do that, the base used for making a metamaterial--like the thin silver films Güney's group uses--that are tweaked at the subwavelength scale so that light waves interact with the material in new ways. While no one has created a perfect lens yet, the metal base Güney tests would look more like a traditional glass lens; light would pass through instead of reflecting off the metal. "Aluminum and silver are the best choices so far in the visible light spectrum, not just for a perfect lens but all metamaterials," Güney says, explaining metamaterials have been successfully created with these metals, although they still tend to absorb light waves. "Loss--or the undesired absorption of light--is good in solar cells, but bad in a lens because it deteriorates the waves." The solution to absorption is all in the light waves themselves, which behave strangely in metamaterials. To create their sci-fi light-bending properties, a perfect lens relies on negative index metamaterials. Positive and negative refer to how a material responds to propagating and decaying light waves, which are like the yin and yang of optics. Most materials--positive index materials--allow only propagating light waves to pass through. Negative index metamaterials on the other hand don't just pass through propagating light waves but also amplify the decaying light waves. "In order for the perfect lens to work, you have to satisfy a lot of electromagnetic constraints," Güney explains. "We don't know how exactly the required optical modes [light waves in the material] need to be excited and protected in the lens for the perfect construction of an image." This difficulty has led researchers to try numerous modifications of the metamaterial make-up, adding bulk, mode-by-mode nit-picking and increasingly complex models. But Güney and his team propose moving away from the complications and going back to the light itself. In their plasmon-injection scheme (shorted to pi-scheme or π-scheme), the researchers take advantage of knowing which light wave crumbles as it passes through the negative index lens. They use this wave--destined to fail in the lens--to shield the desired light wave, allowing it to pass through unscathed. "With this approach, you can engineer this sacrificial wave," Güney says. "It is difficult to construct this wave in other approaches." "Imaging is one of the key technologies for this work," Güney says, adding that a perfect lens could make science and medicine real for people. "It will make life easier to understand because people will be able to see it with their own eyes."